The SEA Team, a group of graduates of the Willem de Kooning Academy in Amsterdam, recently developed the concept of SEA (Search Engine Advertising), taking Google’s Search Engine Optimization to a whole new level. 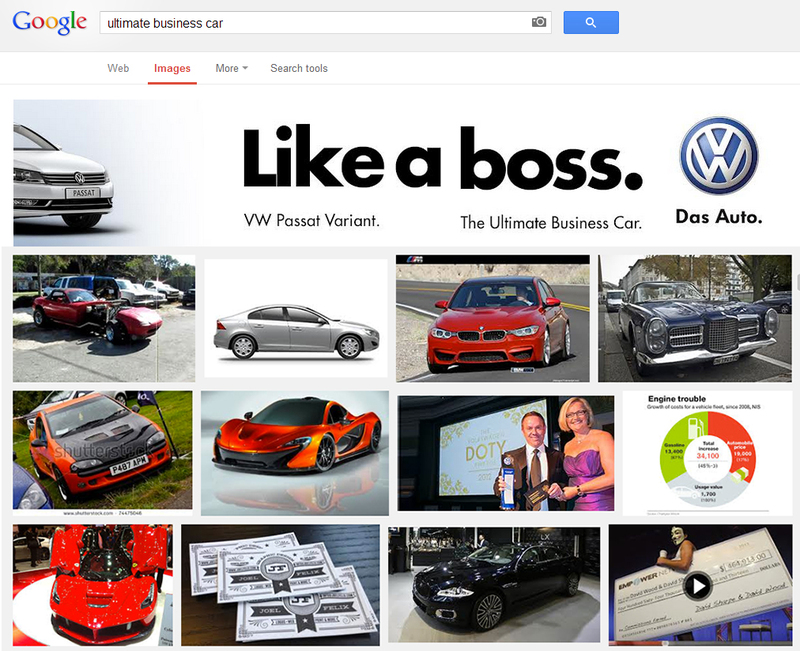 They came up with a way to place a complete ad for Volkswagen in the image search results. The VW Passant Variant is presented as the ultimate business car using images from separate urls, ultimatebusinesscar.com, ultimatebusinesscar.nl. ultimatebusinesscar.biz, ultimatebusinesscar.info, and ultimatebusinesscar.net. The Search Engine Advertising campaign was developed by creative directors Guus ter Beek and Pim van Bommel, art directors Alwin Lanting and Casper ter Beek, working with Qreativ, Amsterdam. Music in the video is Old Look by Kavinsky (Vincent Belorgey).